Fu Xi 伏羲, also written 伏犧 or 伏戲, also called Mi Xi 宓羲 (also written 宓犧), or Pao Xi 包犧, (also written 包羲, 炮犧 or 庖犧), is one of the Three Augusts 三皇 or Five Emperors 五帝 of Chinese mythology. He is therefore known as Xi Huang 犧皇 or Huang Xi 皇羲 "August Shepherd". His cognomen is Tai Hao 太皞 (also written 太昊) "Great Brightness", his tribal name Huang Xiong 黄熊氏. Fu Xi was the brother and husband of Nü Wa 女媧. The couple was, according to legend, the creators of the world. Han period 漢 (206 BCE-220 CE) stone bricks therefore depict Fu Xi and Nü wa with a human body ending in intertwining dragon tails, each of them holding an instrument of architects, namely compasses (ju 榘) and rulers (gui 規). The story of the couple was very widespread in southern China, where the Miao people 苗 saw themselves as descendants of Fu Xi and Nü Wa. The two of them were, in other words, the parents of mankind. 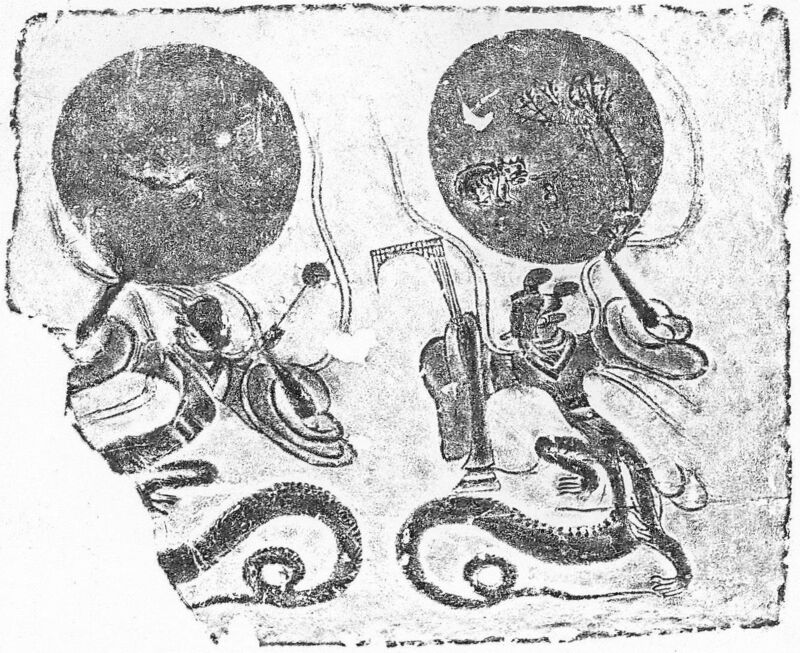 Rubbing of a relief stone from the Han period, showing Fu Xi and Nü Wa. The bodies of both end in dragon tails, but still have legs with claws. They hold compasses and rulers in one their hands each, while the other hand of each person reaches up to hold sun and moon. Nü Wa holds the moon, in the disk of which a toad and a tree are seen, and Fu Xi supports the sun, on which a bird is visible. 56 × 67 cm. Unearthed in Chongqing 崇慶, Sichuan, and kept in the Provincial Museum of Sichuan (Sichuan Sheng Bowuguan 四川省博物館). Source: Zhongguo meishu quanji bianji weiyuanhui 《中國美術全集》編輯委員會, ed. (1993). Zhongguo meishu quanji 中國美術全集, Huihua bian 繪畫編, Vol. 18, Huaxiangshi huaxiangzhuan 畫像石畫像磚 (Shanghai: Shanghai renmin meishu chubanshe), no. 215. Fu Xi is also the deity representing the east and reigning the process wood (mu 木). According to the books Huainanzi 淮南子 and Lüshi chunqiu 呂氏春秋, he is assisted by the spirit Gou Mang 句芒 who pulls out the sprouts of all plants in spring. A story in the Shanhaijing 山海經 says that the mother of Fu Xi was Lady Huaxu 華胥氏 who conceived when she tread on the footpint of the God of Thunder (Leishen 雷神). Fu Xi is credited by several inventions, like the Eight Trigrams (bagua 八卦) used for prognostication. Each one of the trigrams represented a formation of the cosm, like Heaven and Earth, mountains and rivers, wind and thunder, and so on. According to the book Baopuzi 抱朴子 Fu Xi is also credited with the invention of the fishing net. In the song collection Chuci 楚辭 he is called the inventor of music. The book Yishi 繹史 says he invented matrimonial rites that are otherwise attributed to his sister Nü Wa. The Hetu ting fuzuo 河圖挺輔佐 praises him as the one who told men how to use the fire. Emperor Tai Hao is not always identified with Fu Xi. According to other legends, Tai Hao had the surname Feng 風. His officials had the designations of dragons. His residence was Chen 陳 (modern Huaiyang 淮陽, Henan), and he reigned over the lower course of the Yellow River. The families of this region with the surnames Ren 任, Su 宿, Xugou 須句 and Zhuansou 頊臾 (rather the ruling houses of these minor statelets of the Spring and Autumn period 春秋, 770-5th cent. BCE) are said to be his descendants. Tai Hao or Fu Xi are also called Green Emperor (Qing Di 青帝 or Cang Di 蒼帝) and ruled over the East. Chen Quanli 陳全力, Hou Xinyi 侯欣一, ed. (1988). Diwang cidian 帝王辭典 (Xi'an: Shaanxi renmin jiaoyu chubanshe), 4. Li Jianping 李劍平, ed. (1998). Zhongguo shenhua renwu cidian 中國神話人物辭典 (Xi'an: Shaanxi renmin chubanshe), 239. Xiong Tieji 熊鐵基, Yang Youli 楊有禮, ed. (1994). Zhongguo diwang zaixiang cidian 中國帝王宰相辭典 (Wuhan: Hubei jiaoyu chubanshe), 4, 5, 7. Yuan Ke 袁珂, ed. (1985). Zhongguo shenhua chuanshuo cidian 中國神話傳說詞典 (Shanghai: Shanghai cishu chubanshe), 230. Zhang Huizhi 張撝之, Shen Qihui 沈起煒, Liu Dezhong 劉德重, ed. (1999). Zhongguo lidai renming da cidian 中國歷代人名大辭典 (Shanghai: Shanghai guji chubanshe), Vol. 2, 1762.